‘Mai Tao’ orÂ kayu tongkatÂ and ‘Mai Kru’ or kayu guruÂ Â is popularize by Ven. LP Kron of Wat Bangseet. Ven. LP or Archan of ‘Samnak Khao Or’ or Khao Or lineage must have a few requisites before being appointted as Chief Abbot, Mai Tao is one of them. By right, Mai Tao from some Ven. LPs or Archans of Samnak Khao Or are not for outsiders, it is to be given to the following generation of children or disciples. While some Mai Tao are just madeÂ of wood, usually not any kind of wood but most Mai Tao have items embedded into the wood body eg yant, 100% gold, silver and coppersÂ takruts, gold ore nuggets…etc . Different Ven. LP may differs in practise. 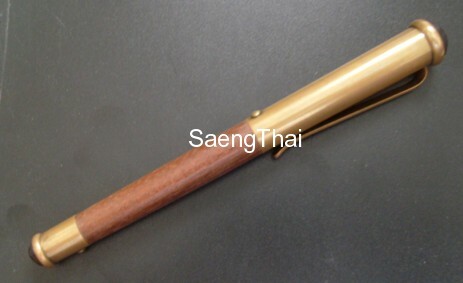 Our Teacher, Ven LP Dam of Wat Mai Naparam uses one and it popularly known to make Mai Tao. Every Mai Tao may differs in energy. I have experienced Ven. LP Kron’s Mai Tao, it is indeed exceptional and very strong. One of Ven. LP Kron’s Mai Tao easily values above RM10,000. One of our customer volunteered for blood donation only to find the nurse had difficulty inserting needle into him. Puzzled but then realised he is carrying a Mai Tao. He took it and placed it on a table. Then the nurse was able to insert the needle. This is a classic example of ‘kungkhapan’ (impenetratability by dangerous object) energy. Another customer who is a entrepreneur himself started to experience business breakthrough to a comfortable level after carrying Mai Tao. Ven. LP Dam asked us to bring our Mai Tao along when we have business meeting or business negotiations but must chant the katha of course. Basically Mai Tao is ideal for individuals of ranks where one needs ‘Amnat’ (firmness, authority and power) energy. It gives positive energy to the bearer of Mai Tao when handling people issues and managing people. Most negotiations are about power-play. We encourage people whom are constantly engaging in negotiations for business or arbitration or individuals whom are of legal litigationÂ professions which may be expose to harm or threat to carry one. Generally Ven. LP Dam’s Mai Tao have Metta Mahalap energy, good also for business enhancement. All Mai Tao have protective energy. Very exceptional rare piece made from kayu kemuning kuning. In 10 kayu kemuning, can only find one! If you scrutinize the photo above, you may find hand inscribed yant by our Teacher. Beware of fakes or copycats! Genuine piece has a coded mark. This batch is still available. 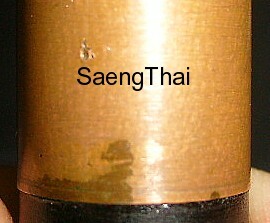 Both ends are covered with his ‘wan pidta’ or sacred Phra Pidta powder. Please beware of copycats orÂ fakes. Our piecesÂ canÂ be verified by Ven. LP himselfÂ . These Mai Taos above are made by Ven. LP Dam for SaengThai members only. 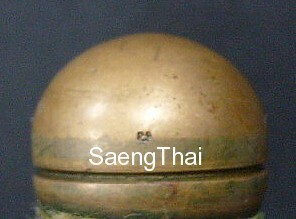 It is recognised among SaengThai group only. This is a very special piece and very limited. Made from Australian Black Wood. This Mai Tao’s secretÂ ingredients are reveal by Ven. Chan Khun Chan of Wat BangseetÂ that follows Mai Tao traditions of Ven. LP Kron of Wat Bangseet. The top, middle and end of this Mai Tao bodyÂ was inserted with different yant and materials. Therefore we have people whom can test energy of amulets telling us this Mai Tao exerts different energy at different areas! This piece is very strong, very suitable for spiritual healers or ‘Mo’. It can be use to exorcise people being overpowered by negative energies. Look at the coded mark to authenticate it. These above are made by Ven. Chao Kun Chan of Wat Bangseet for SaengThai group. Only regcognised among our group.